For environments where space is an issue, an audio metering unit of the TouchMonitor TM7 series is the ideal choice. Combining the simple and flexible operational concept and GUI of the TM9 with a 7" high-grade touch screen, the TM7 lets you configure the instruments of your choice with ease. Instruments can be scaled, randomly positioned and combined for optimized use of available screen space. The modular software concept lets you purchase exactly the features you actually require. Beside the table-top version of TouchMonitor TM7 an OEM version is available for mounting TM7 into mixing consoles or other front panels. It can also be combined with mounting adpaters for a seamless integration into 19"/3U standard racks or into standard 19" rack-mount cabinets for waveform monitors for video studios. The latest firmware version expands the basic software to 4-channel display, 4 x Mono, 2 x Stereo, 2 x Mono and 1 x Stereo can be measured without the need of an activated Multichannel licence. 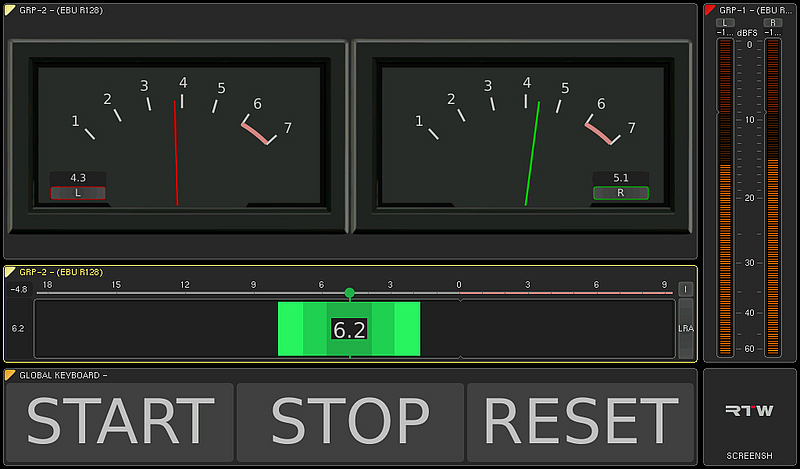 RTA provides a 1/12-octave mode, Cinema Loudness standards (LEQ(M), TASA, SAWA) have been implemented, and the Audio Vectorscope instrument allows up to 4 instances. The output routing can individually be adjusted for each preset, all presets can be exported or imported at the same time. Further details can be found in the Release Notes (included in the update package), or in the data sheet. For existing units the firmware is available for download. See the Audio Monitors/TouchMonitor TM7 section of members area (Manuals & Software). 7 inch desktop TouchMonitor with a 16:9 TFT touch screen display. 32 channel Dante™ AoiP I/O via dedicated primary and secondary RJ-45 connectors. VGA video signal output, RJ-45 Ethernet connectivity, 2 USB 2.0 ports, a GPIO port and a 12 - 24 V DC interlocking power connector Binder 710 type. Standard software. 7 inch desktop TouchMonitor with a 16:9 TFT touch screen display. 8 channel digital AES3-format I/O via D-sub 25p-f and 3G-SDI interface. VGA video signal output, RJ-45 Ethernet connectivity, 2 USB 2.0 ports, a GPIO port and a 24 V DC interlocking power connector Binder 710 type. Standard software. 7 inch desktop TouchMonitor with a 16:9 TFT touch screen display. 8 channel digital AES3-format I/O and 8 channel analog inputs both via D-sub 25p-f. VGA video signal output, RJ-45 Ethernet connectivity, 2 USB 2.0 ports, a GPIO port and a 24 V DC interlocking power connector Binder 710 type. Standard software. 7 inch rack-mount TouchMonitor for TEK rack mounting with a 16:9 TFT touch screen display. 8 channel digital AES3-format I/O via D-sub 25p-f and 3G-SDI interface. VGA video signal output, RJ-45 Ethernet connectivity, 2 USB 2.0 ports, a GPIO port and a 24 V DC interlocking power connector Binder 710 type. Standard software. 7 inch panel-mount TouchMonitor with a 16:9 TFT touch screen display for customer work area mounting e. g. OB vans. 8 channel digital AES3-format I/O and 8 channel analog inputs both via D-sub 25p-f. VGA video signal output, RJ-45 Ethernet connectivity, 2 USB 2.0 ports, a GPIO port and a 24 V DC interlocking power connector Binder 710 type. Standard software. TM7-Dante, TM7-Video, and TM7-Studio each in a sturdy table-top frame with movable table-stand (approx. 245 x 165.5 [185.5] x 46.5  mm, W x H x D [with table-stand]), or TM7-Rack, and TM7-Mount without case as panel-mount units(approx. 188 x 109 x 45 mm, W x H x D), each with specified audio interface, 7" high-grade touch screen (16 : 9 TFT), connectors for Ethernet, VGA, 2 x USB 2.0, GPIO, standard software with easy-to-use graphical interface. 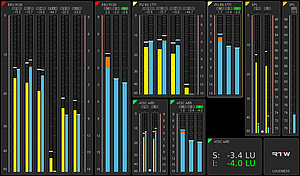 Basic 4-channel PPM with analog (DIN +5, Nordic, British IIa, British IIb) and digital scales (0 to -60 dB, +3 to -60 dB TruePeak, quasi-DIN, quasi-Nordic, quasi-British IIa and IIb) for the display of up to 4 of the routed channels in a maximum count of 4 audio groups at a time (up to 4 x Mono, 2 x 2-channel Stereo, 1 x 2-channel Stereo and up to 2 x Mono), peak hold, phase meter (correlator), a global keyboard, and gain reduction. Multi-channel display and other software modules available as Options. Beside the preconfigured units you can choose your TM7 device from the well-known combinations. Further details can be found in the TM7 data sheet (see "Downloads" tab). With the mounting adapters available as additional hardware options, the TM7 units can be adapted to different environments such like standard 19“ sub-racks or standard 19“ rack-mount cabinets for video racks. Mounting kit including a 19“/3U/42HP rackmount panel (half-19“/3U) and fastening material for mounting 20700OEM into standard 19“ sub-racks. Mounting kit including a half-19“/3U plug-in panel and fastening material for mounting 20700OEM into standard 19“ rack-mount cabinets for video racks. Mounting kit including a table-top frame, robust swivel-mounted table-stand, housing cover, and mounting material for remodelling 20700OEM to a table-top unit. 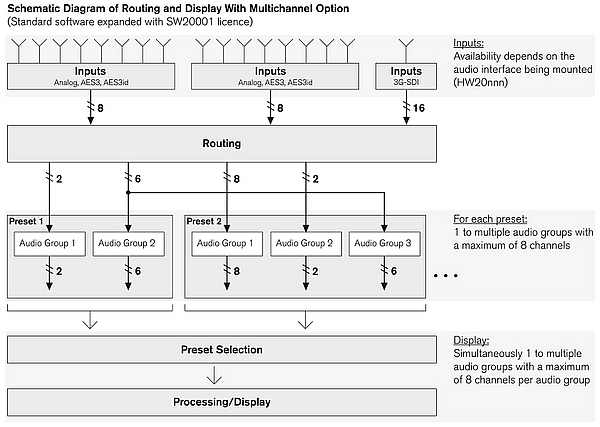 This module expands the signal routing to the simultaneous display of more than 4 channels or channel groups and additionally processes 3.1 Surround, 5.0 Surround, 5.1 Surround, 7.1 Surround (Cinema and DD+), and Multichannel (2 to 8 channels in one block, up to 4 blocks with 3G SDI option) formats. This module expands the basic 4-channel PPM with Loudness measuring functions as described in current guidelines (EBU R128, ITU-R BS.1770-4/1771-1, ATSC A/85, ARIB, OP-59, AGCOM, CALM, LEQ(M), TASA, SAWA), and the LRA instrument for the graphical display of the Loudness Range. A customer-specific mode allows the user to modify parameters. In addition the module provides the SPL display mode with various weighting filters and integration times as well as reference level adjust to calculate an SPL value from an electrical signal. For signals with more than four channels software module SW20001 is required. This module provides in 1/3-octave, 1/6-octave, or 1/12-octave mode a spectral distribution display for single channels, channel pairs or groups plus HP HF band. 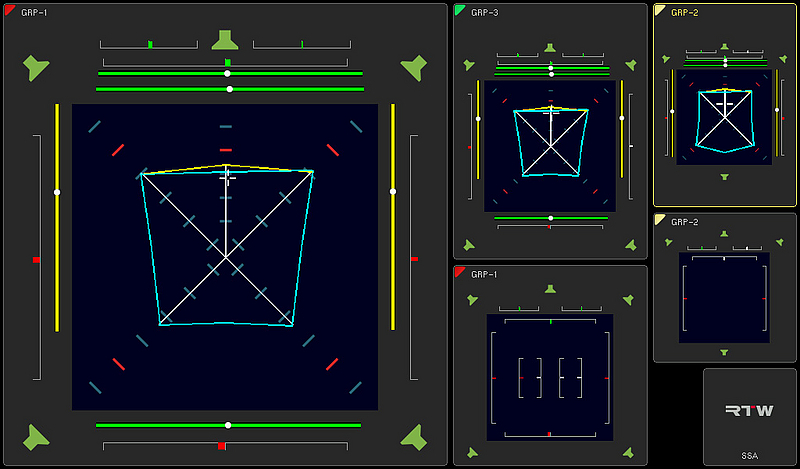 This module is a powerful tool for visualizing the interaction of all important parameters of surround signals. The dynamic behaviour of all display elements (House display) corresponds to the subjective listening impression, enabling you to see the balance of a surround programme intuitively and at a glance. This module provides a high resolution circular Loudness display for Momentary values and history, enhanced with numerical display of measuring time and two descriptors. The Radar Display equals the Loudness Radar Meter of TC Electronic®. 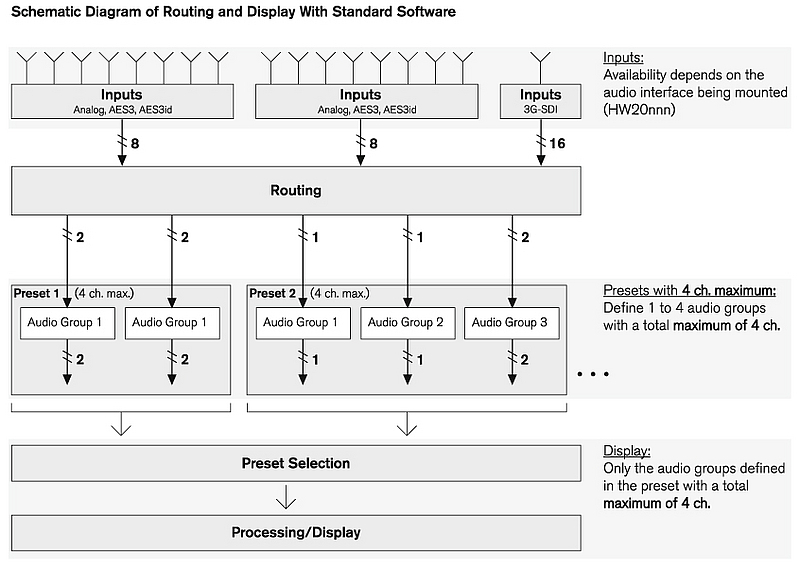 This module expands the Basic Stereo PPM (standard software) with additional scales (Zoom, SMPTE, NHK, ARD+9, et al. ), additional display modes (segment, classic), and PPM/VU moving coil instruments with different scales and functions. 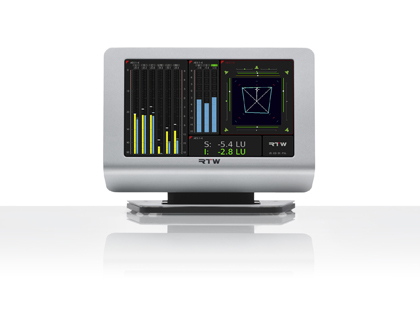 It also provides up to four 2-channel Audio Vectorscopes and a separate phase meter. With software module SW20001 installed, the Multichannel PPM is also extended with these functions and enhanced with the Multi-Correlator (up to 10 phase meters). The Gain Reduction is added with Multi-Channel mode. This module provides the Timecode function as a separate mode generating an individual audio group providing the Timecode Reader instrument. It is used to decode and to display an SDI-embedded or LTC timecode using the 3G-SDI interface (if installed) or one of the selectable audio inputs. The module also includes the Loud. Recal. instrument for the control of a loudness measurement by a timecode either with recalcualtion or without. This module is a tool to allow generating digital line test signals according to EBU 3304, GLITS, and BLITS definitions as well as automatic and significant analyzing of channel allocation, level, phase and delay, and polarity of received BLITS 5.1 test signals. 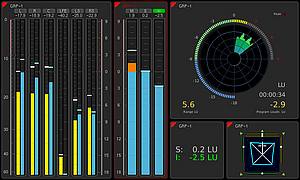 This module allows to collect data of Loudness and TruePeak measurements and either to store them on a USB flash drive or to send them via IP connection to the LQL - Loudness Quality Logger PC software for analyzing (available free of charge at PC Software/LQL - Loudness Quality Logger section to registered users). At Audio Monitors/TouchMonitor TM7 - Manuals section of members area (Manuals & Software) you may find a tutorial. The module also includes the Loudness Chart instrument for displaying and analyzing the course of a loudness measurement directly on TM7's display. 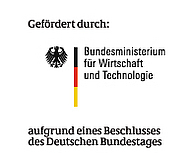 This module converts TouchMonitor devices of TC electronic® to RTW units to allow the installation of upcoming licences with new product functionalities. After the licence has been activated and the update process has been repeated, the units will start with the RTW boot screen. Additionally, customers will get the RTW logo as front label to replace the TC logo. 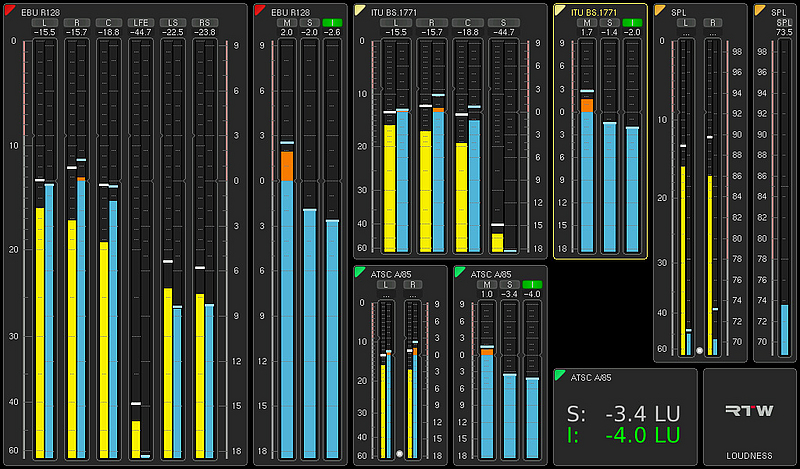 PPM and TruePeak meter for up to 8 channels in a group processing Mono, Stereo, 3.1-Surround, 5.0 Surround, 5.1 Surround, 7.1 Surround (Cinema and DD+), and Multi-Channel (2 to 8 channels in one block, up to 4 blocks with 3G SDI option) formats. 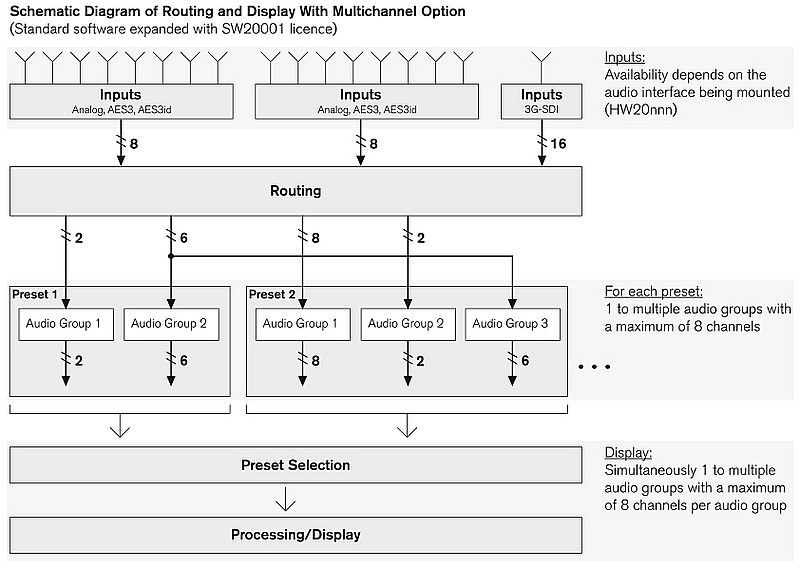 Simultaneous display of multiple channels or channel groups. Analog and digital scales, Peak Hold, Peak Memory, Over indicator, numerical display. Additional control keys for positioning on the display. 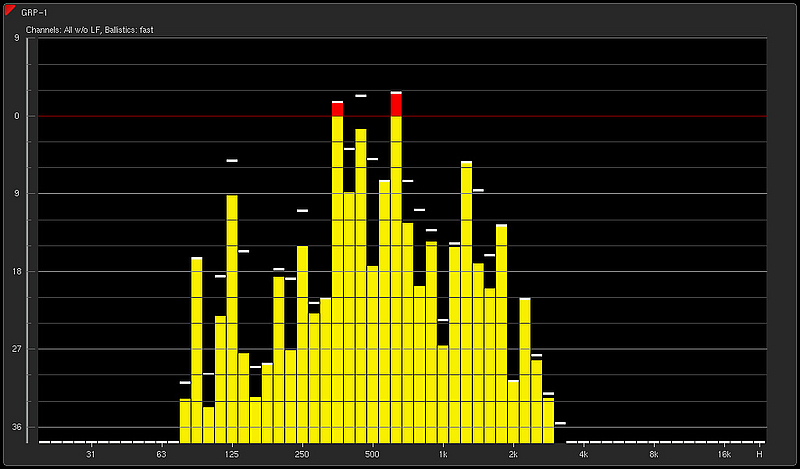 Loudness bargraphs switchable with SW20002. Loudness Sum bargraph instrument for the display of the summed Loudness values M, S, and/or I of a Loudness measurement acc. to EBU R128, ITU BS.1770-4/1771-1, ARIB, ATSC A/85, OP-59, AGCOM, CALM Act, LEQ(M), TASA, SAWA, or specified by customer. SPL meter. Additional control keys for positioning on the display. 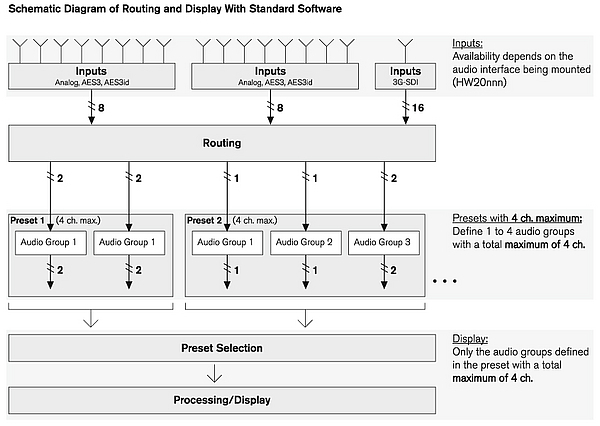 Decoding and display of an SDI-embedded or LTC timecode using the 3G-SDI interface (with HW20714) or one of the selectable audio inputs. Instruments can be scaled, randomly positioned and combined. 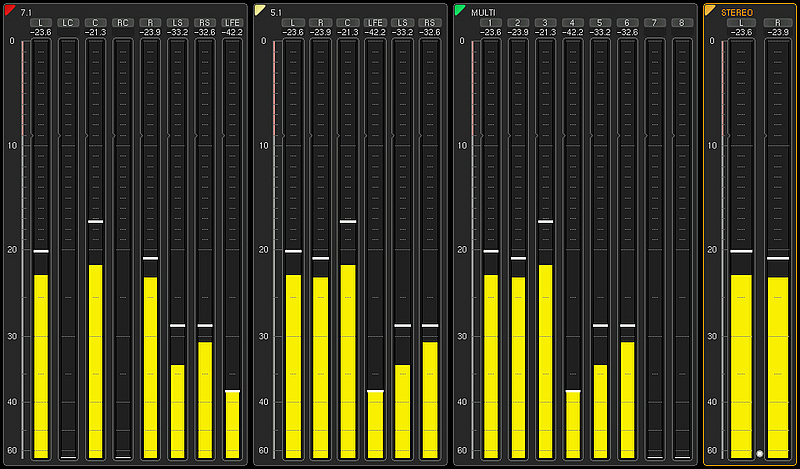 This example shows a combined Loudness Meter and Peak Program Meter (left), additional Loudness bargraphs for the display of the summed momentary (M), shortterm (S) and longterm (I) Loudness values (middle), the Loudness Radar Meter of TC Electronic® (right above), the numerical Loudness display (below) and the Surround Sound Analyzer (House display, to the right). 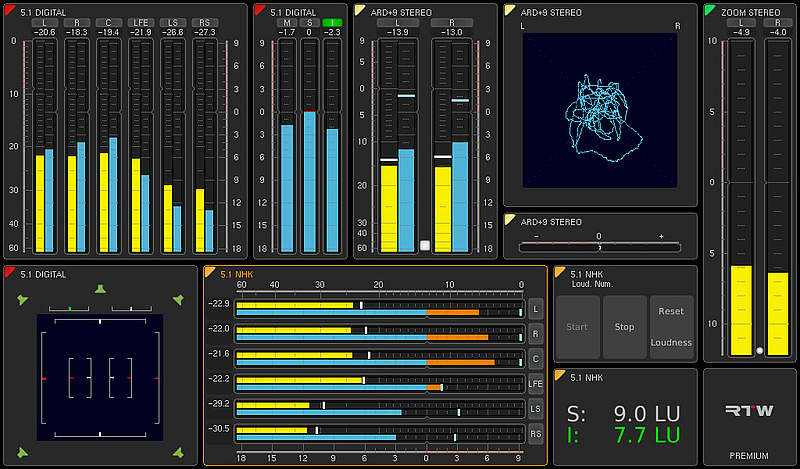 This example shows some extensions of firmware version 2 on one screen: The Moving Coil instruments are switched to BR IIa scale and single channel display (above). 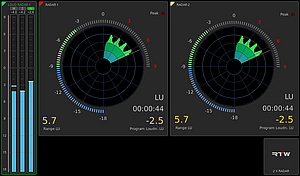 The LRA instrument (middle) using "MagicLRA + I + Num" mode displays the integrated Loudness value and the Loudness Range. The PPM (right) uses the Classic mode to simulate the look of RTW's classical peakmeters with gas-plasma displays. The Global Keyboard (below) is a customizable keypad that can be used for issuing global start/stop/reset messages to multiple instruments. With Loudness licence activated (see Options) Loudness measurements acc. to the current standards like EBU R128, ITU-R BS.1770-3/1771-1, ATSC A/85, ARIB, OP-59, AGCOM, CALM, and SPL measurements can be made. The different groups on the screenshot show some examples. 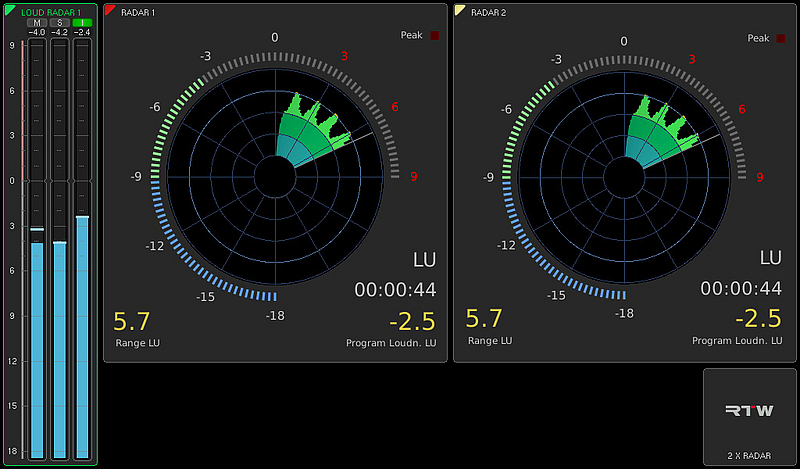 Additional the LRA instrument for the graphical display of the Loudness Range is available. With Multichannel licence activated (see Options) several groups with different channel formats inside a preset can be displayed simultaneously. The screenshot shows examples of different groups. With RTA licence activated (see Options) the Real Time Analyzer displays the frequency spectrum of the selected input channels. 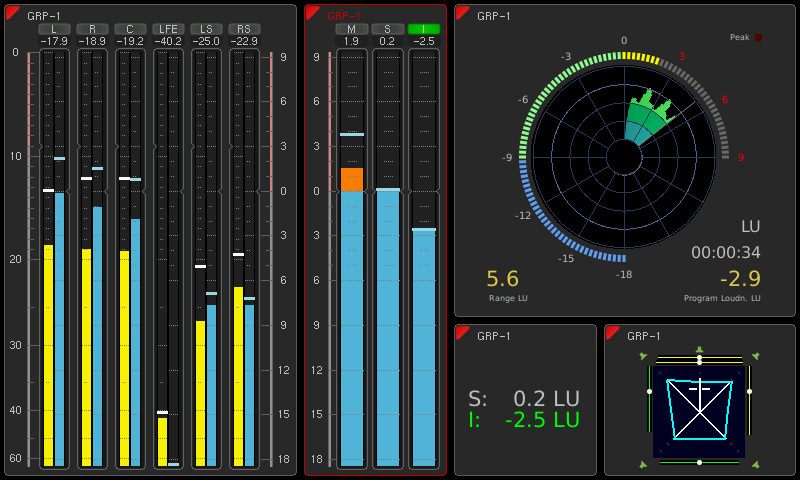 With Multichannel licence, Loudness licence and SSA licence activated (see Options) the Surround Sound Analyzer visualizes the dynamic behaviour of all display elements enabling you to see the balance of a surround programme intuitively and at a glance. The different groups on the screenshot show some examples. With Loudness licence and Radar licence activated (see Options) Loudness measurements also can be made with the Loudness Radar Meter of TC Electronic®. 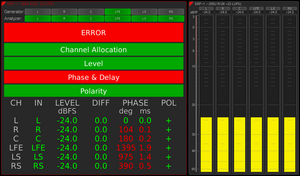 Beside the Loudness Sum Meter the screenshot shows two Radar instruments running. Two indipendent audio signals can be monitored simultaneously. With Premium PPM licence activated (see Options) additional scales and instruments like Audio Vectorscope or Multi-Correlator (with Multichannel licence) are available. The example shows beside the classical digital scale (group with red marker) the ARD+9 scale (yellow marker), an NHK scale (orange marker), and a Zoom scale (green marker). 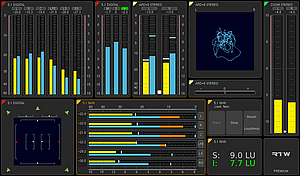 The Audio Vectorscope is added to the yellow stereo group and the Multi-Correlator to the red 5.1 group. Added are Moving Coil instruments for stereo modes displaying different scales in different arrangements. PPM's additionally can be displayed with segments or in a classic mode to simulate the look of RTW's classical peakmeters with gas-plasma displays. 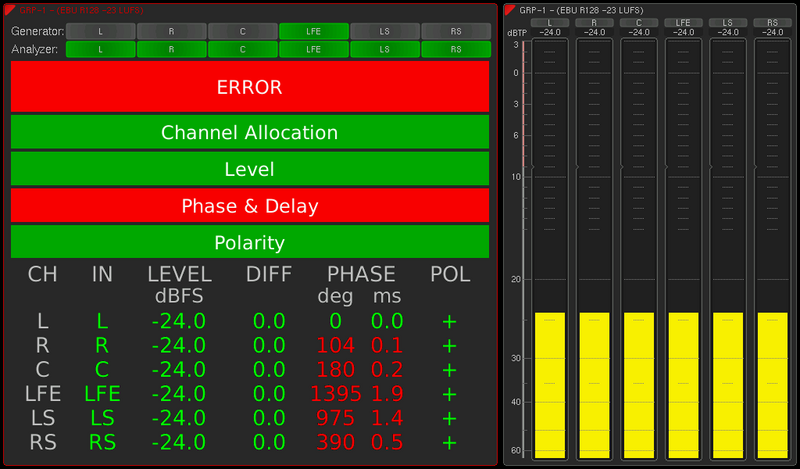 With BLITS licence activated (see Options) RTW provides an instrument not only to generate a BLITS test signal but to use the BLITS sequence for a user friendly and comprehensive analysis and display of level, channel allocation, phase, delay and polarity of incoming digital audio signals in 5.1 mode. Adjustable limits complement the analyzer. 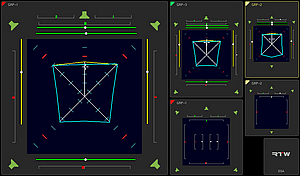 The sequence can be acquired from any digital input of the TouchMonitor. 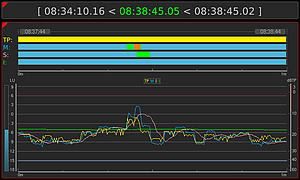 The example shows on the upper left line an outgoing BLITS test signal, below it an incomingsignal. The green bars resp. red ones, if faulty, display the status of channel allocation, level, phase and delay, and polarity of the incoming BLITS test signal. The table displayed in the lower left half reports the significant analysis in detail. 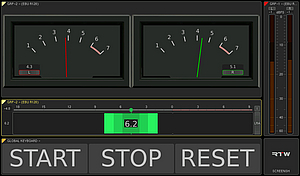 Additionally, a peakmeter for level control with bargraph is displayed in the right half. This example shows a combination of the "Loud. Recal." 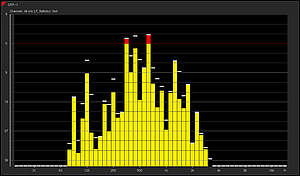 instrument (loudness recalculation) of the Timecode Reader licence together with the Loudness Chart instrument of the Logging Data Server licence. This allows loudness measurements controlled by a timecode with recalculation and the display of the course of its measured values (TP, M, S, I) for analyzing. Downloads for Manuals & Software can be found in our members area.